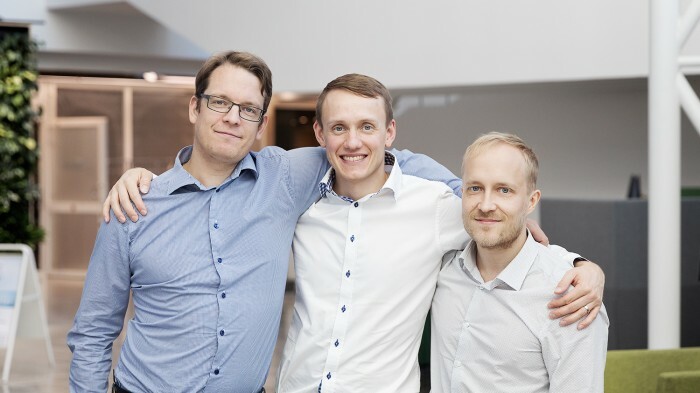 SYNOSTE is a Finnish venture, which was started in 2007 by three young engineering students Harri, Antti, and Juha studying at Aalto University, Finland. The company was established in Helsinki in 2012 and expanded to Germany the following year. Their passion, skills and competencies have led them to develop a solution for millions of people less fortunate than themselves – people suffering from bone deformities. The three founders were just normal, fun-loving students who gradually built up expertise in the management of smart materials, micro mechanics and wireless technology. What set them apart from their student colleagues was their drive to be entrepreneurs – not working for someone else. They decided to pool their competencies, skills and know how to correcting different types of bone deformities – people with curved backs (Scoliosis) or people whose two legs or arms were not of equal length (Limb Length Discrepancy, LLD). They decided to prioritize creating an application for LLD because today’s standard of care was based on technology over sixty years old and was known for its high complication rates. What they didn’t realize was that they had chosen one of the toughest and most challenging areas in orthopedics. However, history teaches us that some of the world’s best and life changing innovations have come when the inventor was unwittingly naive enough to rise to impossible challenges. "Finnish innovation! Femur lengthening surgery was a success in Helsinki." "They have invented a novel patient-friendly solution for bone lengthening treatment"
"SYNOSTE Ltd raises €5.1 million to launch its smart skeletal deformation correction technology"
"Kirurgijärjestö avaa ovet luustoa korjaavalle startupille - Synoste sai 5 miljoonan sijoituspotin"
"A globally unique method to lengthen bone"
"Moving the orthopaedic sector forward." SYNOSTE’s business is built around the vision, know-how and scientific expertise of the three founding engineers who transferred their university research into innovative products with a good cause. The three founders have committed everything to developing their vision – SYNOSTE is their passion; they have invested their time, their energy and what capital they had into this venture. Join our entrepreneurial and innovative team! You will join a dynamic design & development group with competences in implantable medical devices using shape-memory materials and superalloys. We expect you to bring relevant experience and to contribute to our projects with a unique set of competences and creative attitudes in developing complex mechanisms, prototyping and industrial design. It is exciting to be part of a team as passioned as SYNOSTE. To change people's lives for the better meets my own values. The vast variety of interesting and challenging tasks keeps me motivated. SYNOSTE's innovative and entrepreneurial team puts my experience to the test every day. Finding smart compliance solutions for a virtual manufacturing organisation is as demanding as it is rewarding. I have chance to solve challenging tasks in the field of mechanical engineering. And all this is done among talented and motivated workmates, which makes the work enjoyable! What must a 3rd generation Limb Lengthening system be able to do to make a quantum leap in performance and fulfill the newest trends in healthcare driven by Value-Based Healthcare and Personalized Medicine initiatives? Limb Lengthening procedures were pioneered and made popular by Prof. Gavril Ilizarov, a Russian orthopedic surgeon, and his external fixator frame more than sixty years ago. Since Ilizarov’s day there have been many copies and renditions of his famous frame, and his procedures are now performed around the world. In the early 2000’s, expanding implantable nails using a procedure similar to intramedullary nailing were first used. The expense of these nails was offset by the reduced pain, less scarring, and less interruption to patient’s lives. The first generation nails promised a lot, but had their own set of problems. The second decade of the new millennium has introduced a second generation nail offering a degree of superiority over the fifteen year-old technologies. The third generation needs to promise more than just an advancement in nail technology, it needs to be a complete package solution, offering a quantifiable improvement in outcomes and a new level of personal experience for both surgeons and patients. Share your experiences and help us to build the 3rd generation! How can a 3rd generation Limb Lengthening system change the users’ experience? What will a 3rd generation Limb Lengthening system have to do to achieve a dramatic leap in patient outcomes? The concept of products alone, e.g., Limb Lengthening frames or implants is passé. Many surgeons and patients may not know it today, but the trend is towards solutions that in the hands of anyone will improve the users’ personal performance and experience. External fixators remain the standard and continue to offer the flexibility to handle complex or highly deformed Limb Lengthening cases. However, there are well-documented disadvantages due to complications, which given today’s technology needlessly impact a patient’s quality of life. It is often said: “today’s problems, were yesterday’s solutions”. The second generation nails offer advantages over external fixators, especially in allowing patients to unobtrusively undergo the procedure and rehabilitation. In the hands of very specialist surgeons, today’s second generation nails support reproducible outcomes. However, are these second generation nails complication free? The somewhat obsessive drive towards ever-smaller nails, widens the opportunities for the procedure. Nonetheless, they are not necessarily in the best interest of all patients – who would not want to return to full weight bearing immediately after the surgery? Simply put, thinner nails may be less stable and therefore risk of breakages is higher, thus preventing normal use of the limb. The key to 3rd generation nails is to provide a complete solution that can be safely applied by more surgeons, benefit more patients, and ensure a positive user experience. The new Limb Lengthening technology must impact and change the user experience and outcomes like the iPhone did to the mobile phone industry. That is the challenge, a challenge worth pursuing, and from the users’ perspective a challenge worth demanding. Share your outcomes and help us to build the 3rd generation! For many Limb Lengthening patients the home period where distraction and osteogenesis occurs can be a time of great pain, frustration and inconvenience. Helping patients through this process enhances their experience and improves their outcomes. How would you expect a 3rd Generation Limb Lengthening solution to change today’s negative experiences during the home care period? It was not so long ago, that patients with external fixators had the somber choice of staying in hospital during the entire distraction period or being sent home with a “do-it-yourself” kit consisting of spanner and screwdriver. The real fun begins when you forget the protocol! Thank goodness modern healthcare has moved on since then, or has it? There are still some limitations in using traditional strong magnets in the home environment and that correct use of the external control units require strict supervision with the second generation nails. The user errors reduce the controllability of the nail and have negative effect on the predictability of the treatment outcomes. We live in the second decade of the 21st Century; such home care procedures should be relegated to the past. What will patients expect in terms of home-care in the future with the new 3rd Generation Limb Lengthening solutions? Following the trends in personalized healthcare we can anticipate: total control and predictability during the distraction stage, AND with a high level of customer convenience and ease of use. Every surgeon and patient wants to have confidence and trust in the solutions they choose. How will a surgeon define “safety” in tomorrow’s evermore-litigious healthcare environment? The Internet has changed how patients can learn about their disorder and possible treatments; there is now no reason not to understand the safety issues of every Limb Lengthening procedure. The 3rd generation Limb Lengthening solutions will completely change peoples’ view and appreciation of safety. Today people focus on product safety. The 3rd generation approach covers product safety, but considers treatment process safety too. 3rd generations solutions will not be compromised by a surgeon’s experience or on a patient’s demographics, compliance in terms of load-bearing, capability to recall nuances of the lengthening protocol or future activities. A safe Limb Lengthening solution should provide a combination of products and services that aims to achieve and offer a 100% guarantee in outcome reproducibility across all stakeholders involved in the treatment. It’s fashionable to launch ever-smaller nails to open the opportunity for lengthening procedures in smaller boned people. That’s OK, however, when you want guaranteed results, full weight-bearing and return to past activities, then the strength, robustness, and security of the intramedullary nail becomes a critical success factor. Predictability is defined as the degree to which a correct prediction or forecast of a system's state can be made. The critical success factor in Limb Lengthening is about utilizing the right technologies to attain certainty: fail-safe predictability and precision in the elongation of the nail to achieve the lengthening desired by the patient and the surgeon. All products claim that they facilitate control; however, it is control that truly differentiates 3rd generation systems from the rest of the field. The biggest factor leading to poor control in current generation products is the human factor – user errors and inability to follow the treatment plan – combined with the lack of tools for following the treatment progress. The 3rd generation system will remove the human factor and improve the controllability of the treatment. Having access to an independent and trusted self-support community helps patients to make better decisions. A “community of practice”, supports life-long learning by enabling surgeons to continually and freely share and exchange their experiences. Eminence-based education has been replaced by learner-oriented training that truly prepares a surgeon and enhances their competencies. We need three 'best things' to get best outcomes in bone lengthening journey; Surgeon, Patient compliance, and Lengthening device. Increasing use of strong bio-compatible shape memory alloys, which predictably contracts and expands upon heating or cooling. The predictability provides insurance for the surgeon and the patient – lengthening can be totally controlled. A modern wireless technology is not just about transferring energy. It can sense, communicate and give feedback for the patient and surgeon about successful positioning and lengthening. Modern biocompatible superalloys will enable the 3rd generation nails to allow full weight bearing and normal walking from day one without nail breakages and unwanted backtracking. Join our mailing list to learn about Synoste! Synoste Oy (“SYNOSTE”) maintains this web site (“Site”) and all the information, communications, software, photos, scripting, video, text, music, graphics, sound, images and other materials and services found on this Site (collectively “Content”), for the users of its customers and members of the general public but only for the lawful purposes described below. By accessing, browsing and/or using this Site you agree to be bound by these terms (“Terms”) and to comply with all applicable laws and regulations. You represent that you have the legal authority to accept these Terms on behalf of yourself or any party you represent. If any provision of these Terms is held invalid by any law, rule, order or regulation of any government or by final determination of any court, such invalidity shall not affect the enforceability of any other provision of these Terms. If you do not agree to these terms, please notice that you are not allowed to use this Site. Individual documents on this Site may be subject to additional terms indicated in those documents. This Site is controlled and operated by SYNOSTE from its offices within Finland. By accessing this Site you agree that the LAWS OF FINLAND, without regard to principles of the conflicts of laws, shall apply to the matters relating to the use of this Site. SYNOSTE makes no representation that the Content on this Site is appropriate or available for use in other locations, and access to it from territories where its contents is illegal or prohibited. Those who access this Site from other locations do so at their own risk and are responsible for compliance with applicable local laws. You acknowledge that SYNOSTE may in its sole discretion refuse or terminate access to this Site by you at any time. The Content is Copyright © Synoste Oy 2015. ALL RIGHTS RESERVED. The Content is protected by copyright laws, international treaty provisions and all applicable national laws. You may not reproduce (whether by linking, framing or any other method), transfer, distribute or storage of part or all of the Content in any form without the prior written consent of SYNOSTE except in accordance with the following terms. SYNOSTE consents to you displaying, downloading or printing portions of the material from the different areas of these pages solely for your own non-commercial use. You may not change or delete any proprietary notices from materials downloaded from this Site. Any communication or material you transmit to SYNOSTE via this Site or electronic mail will be deemed NOT to be confidential. You agree that the communication and material will not contain any item that is unlawful or otherwise unfit for publication, that you will use your best efforts to scan and remove any viruses or other contaminating or destructive features before sending any communication or material, and that you own the material or have the unlimited right to provide it to SYNOSTE. SYNOSTE is under no obligation to refrain from reproducing, publishing or otherwise using the communication or material in any way or for any purpose. SYNOSTE shall be free to use content of any such communication and material, including any ideas, inventions, concepts, techniques or know-how disclosed therein, for any purpose including developing, manufacturing and/or marketing goods or services, without compensation to the provider of the submissions. You agree not to take action against SYNOSTE related to material you send and you agree to indemnify SYNOSTE if any third party takes action against SYNOSTE related to the material you send. SYNOSTE cannot review the content posted by users on this Site. SYNOSTE is not responsible for the content and information contained therein, including its truthfulness and accuracy. SYNOSTE may at any time at its discretion remove any content posted by users. SYNOSTE may revise or withdraw the Content, in whole or in part, at any time without notice. SYNOSTE may revise these Terms from time to time by updating this posting. By using this Site, you agree to be bound by any such revisions and you agree to periodically visit this page to determine the then current Terms to which you are bound. SYNOSTE is providing this site and its contents on an “as is” and “as available” basis and makes no representations or warranties of any kind, whether express or implied, with respect to the availability, accuracy, reliability or content of the site or any other web sites linked to or from this site. To the fullest extent permissable pursuant to applicable law, SYNOSTE disclaims all such representations and warranties, express or implied, including, but not limited to, warranties of title or non-infringement or implied warranties of merchantability and fitness for a particular purpose. In addition, SYNOSTE does not represent or warrant that this site will be uniterrupted or error-free, that the defects will be corrected, or that this site or the server that makes these pages available are free of viruses or other harmful components. Applicable law may not allow the exclusion of certain warranties, so the above exclusion may not apply to you. SYNOSTE shall not be liable for any direct, indirect, incidental, special or consequential damages, lost profits of for business interruption arising out of your access, use or inability to use this site, or any errors or omissions in the content, even if SYNOSTE has been advised of the possibility of such damages. Applicable law may not allow the limitation or exclusion of certain limitations of liability, so the above limitation or exclusion may not apply to you. The names Synoste and Nitinail are registered trademarks of SYNOSTE. All product names are registered trademarks or trademarks of SYNOSTE. Other trade names or trademarks may be trade names or trademarks of third parties. You are not granted, by implication or otherwise, any license or right to use any marks appearing on this Site. Copyright © Synoste Oy 2015. ALL RIGHTS RESERVED. Synoste may collect non-personally identifiable information about you in a number of ways including tracking your activities through your IP address or the most recently visited URLs. This information is used on an aggregated basis to measure the number of visits, average time spent on this Site, pages viewed, and other technical data. We also use it to monitor the use of this Site and to improve the overall quality and content of the online experience. In addition to collecting this type of information, we collect data about site downloads and queries for targeted advertising purposes, including the possible interests of site visitors and their demographics. Please note that we may provide this information to reputable third parties, but this information will include no personally identifiable information. In order to provide you certain services through this Site, we may ask you for personal information. We may use this information for marketing and promotional purposes. Information may be used for research and development purposes. If you object to such use for any reason, you may stop that use at any time by written request. The request should be sent to us at contact@synoste.com. We will not, without your permission, provide this personal information to other third parties, except as necessary to fulfill your requests. SYNOSTE will on its own initiative, correct or erase any personal data, which is incomplete, inaccurate or outdated for the purposes for which it is used..
browser to do so, if your browser so permits.